The Colosseum is the fighting arena owned by the champion Bracus. Now after the death of their friend, Rhee and Roberts want revenge. Who's Ready for Some Serious Face Kicking? Finch: The buck stops here, bucko! Alex Grady: You! I owe you! 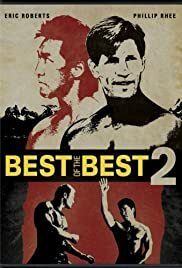 If you want to talk about a movie that's a black hole for careers, let's talk about Best of the Best 2. Director Robert Radler wound up working on Power Rangers episodes, Eric Roberts usually appears in magazines making jealous comments about his much more successful sister, and Philip Rhee...well, the less said about Best of the Best 3 and 4, the better. Ralf Moeller, the chief bad guy, usually winds up playing the big sidekick, most visibly in Gladiator. Ironically, he's probably made out better than anyone else involved, save for the invincible Wayne Newton. Judged by the standards of its genre, the movie isn't entirely terrible. Judging action movies on the same scale as more respectable fare is like expecting your 59 cent hamburger to taste like steak, and Best of the Best 2 is better than a lot of comparable movies I've seen. The fight scenes are refreshingly high-impact and plentiful, Newton is as deliciously slimy as Richard Dawson in The Running Man, and Moeller makes for a formidable bad guy in the ring. In these respects and others, this movie compares well with better-known movies like Bloodsport or the terrible Kickboxer. The bad parts are definitely bad, however. The script, as is usual for the genre, consists of the standard tough-guy posturing, but is not even particularly clever at that. Roberts looks like he's being directed to think about his paycheck whenever he's supposed to act happy. Rhee (the real star) does a good job in the ring, but his transformation from calm martial artist to brutal vengeance artist is not really played at all. The bad guys, other than Moeller and to some extent Newton, are completely devoid of menace. The worst part of all - and one of the most cringe-inducing scenes I've ever witnessed - is the first scene with James, where a pathetic drunk's tragic fall is played for laughs. This scene will and should offend almost anyone who understands it. On the ugly side, the movie's production design definitely reflects its budget. Best of the Best 2 looks and sounds at least 10 years older than it actually is. In style, form, and substance, it's well behind the curve. Some of the violence is really painful to watch, namely two close-ups of Rhee breaking limbs in hapkido arm locks. This is a cheap shot, but Roberts' girlfriend looks like she's about 70. All told, it is not a study in economy. Shot for about the same budget as a Star Trek: The Next Generation 2-part episode, this movie looks way worse. Is it completely terrible? Well, don't be looking for The Godfather. If some cheesy fighting is your bag, however, you're looking at the right movie. Recommended for genre diehards and 12-year-olds, but not really for anyone else.